XLrator Media has acquired global distribution rights to the science-fiction thriller INFINITY CHAMBER and will release the film in U.S. theaters on September 15 and on VOD and iTunes September 26. The film will roll out internationally later this year and early 2018. 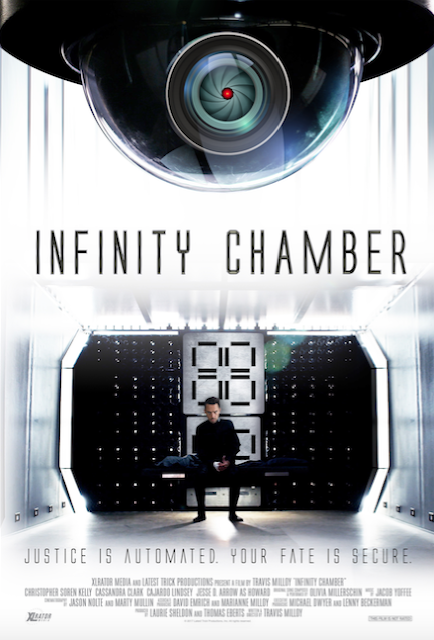 INFINITY CHAMBER was written and directed by Travis Milloy (writer and executive producer of the Dennis Quaid-Ben Foster sci-fi actioner Pandorum) in his feature directorial debut and produced by Laurie Sheldon and Tom Eberts. The film stars Christopher Soren Kelly (Ink), Cassandra Clark (“Englishman in L.A.”) and Jessie Arrow. The film soundtrack by Jacob Yoffee will be available on digital services September 25. INFINITY CHAMBER is set in a fully automated government prison in the future. Subjected to relentless computer interrogation, a wrongfully imprisoned man must outwit his captors and escape to the outside world that may already be wiped out.